I'm back home in New England this week; I'm wearing my fleece, enjoying brilliant foliage, and subsisting on a diet of apples and goods baked with apples. Although you can't compare the year-round fresh produce in San Diego with the produce here, when it comes to apples, New England is indisputably #1. Although any apple can be shined on your sleeve and eaten as is, we usually divide them into eating and cooking apples: firm Cortlands for baking pies; soft MacIntosh for apple sauce; crisp Macouns for eating. 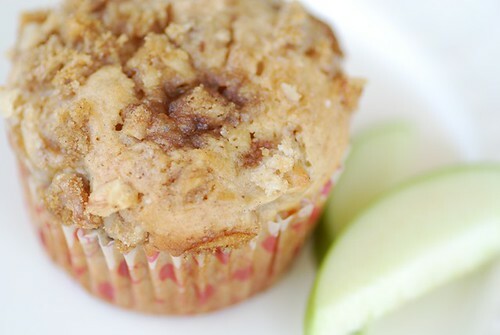 Before I left San Diego, I used some Granny Smith apples I had to make these Old-Fashioned Spiced Apple Streusel Muffins. The sour tang of Granny Smiths contrasts deliciously with sweet raisins, brown sugar, and spices. The beauty of this Granny Smith recipe is that they taste like your grandmother's homey spiced apple streusel muffins but with a youthful jolt of tartness. Pair them with a latte for a San Diego treat, or go New England with a nice, hot cup 'a coffee. 1. Place rack in center of oven and preheat to 375 degrees F. Line a 12-mold regular size muffin pan with paper muffins cups. 2. To make the streusel, combine flour, sugar, cinnamon, and walnuts. Cut cold butter into small pieces. Using your fingertips, rub butter into the mixture until a pebbly texture forms. Refrigerate while making the muffins. 3. For the apples: Put peeled apples in a small bowl, and douse with lemon juice. Toss to coat. In a medium skillet over medium high heat, melt 2 teaspoons butter. Add apples and sprinkle with 1/4 teaspoon apple pie spice. Add raisins. Cook for 3-5 minutes, or until apples are lightly browned and tender. Remove from heat. 4. For the muffins: Combine flour, sugar, baking powder, baking soda, salt, and 1 teaspoon apple pie spice in a large bowl and stir well. 5. In a separate bowl, combine melted butter, buttermilk, eggs, and vanilla extract; whisk well. Add to the flour mixture, stirring until just combined. Fold in the cooked apples. 6. Spoon the batter evenly into the into 12 muffin cups. 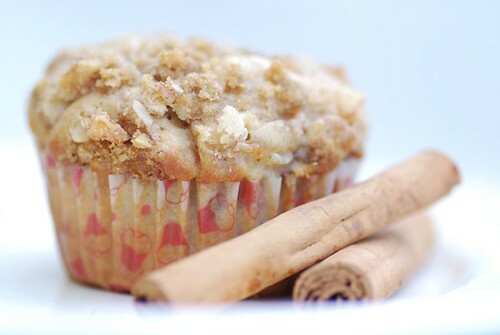 Remove streusel from refrigerator, and sprinkle evenly over the top of the muffins. Bake for 18-20 minutes, or until the tops are golden brown and a cake tester inserted into the center of a muffin comes out clean. Transfer the pan to a rack to cool for 5 minutes before removing each muffin and placing on a wire rack to cool. Muffins, pies, anything with a streusel topping has little bit of that extra something. I'm so glad I found your site. Can't wait to read through it! Great photos! I'm in an apple mood around here too, but I'm guessing the apples in New England are extra good. Glad you're getting to visit. Yes, this time of year is amazing when it comes to apple picking this time of year! I love your recipe and will be marking it to test on my oldest... he loves a homemade muffin for his snack at school! Oh, I love apple season. I like the idea of the streusel on top. Thank you so much for including a link to my site, Susan! This recipe looks great! I have a whole car full of apples from my weekend in Vermont, so apple recipes are much welcomed right now. This will be perfect for baking today; it's wet and chilly and these muffins will warm us nicely. I love apple season so much!! It's an awesome time in MN as well. These look scrumptious, Susan! I'm just coming off my pumpkin baking phase and I think apples may be next so this recipe comes at a great time. What a nice looking muffin! Love the idea of the topping :-) The pictures of the apples are very cute! I have looked for a new post!!! These look great. I am finished with my quick bread unit, but will try these with my next semester class. Thanks. Oh what a glorious sight! I love the muffins, and will definitely make them soon, before summer comes and the warming flavours are not as welcome. Delicious! May try these tonight! These sound so yummy! I'm a big fan of streusel topping! I'm so jealous... my husband is in CT today and then is going up to MA for the weekend w/ relatives (though I hear that you are having a Nor'Easter back there at the moment!! )Still, it would be nice to experience a bit of chilly weather for once. Your muffins look delicious. Did you happen to pick apples in Julian this year? This is the muffin I want with my cappuccino! Delicious topping, and the lemon and raisins with the apple sound great. Hope you're having a good time in New England! Did you wake up to snow this morning like I did? These look amazing! Was just looking for something good to make the the (way too many) apples I picked last weekend! Welcome back to the East Coast! These look great - I adore streusel. (Who doesn't?) Thanks for the shout-out, too! Lovely recipe! What a coincidence - I've posted an apple recipe too:) only mine was with Mutsu apples because I went apple-picking:) but are usually made with Granny Smith. I envy you being on the east coast with all the fall colors. And your muffins look droolingly divine! 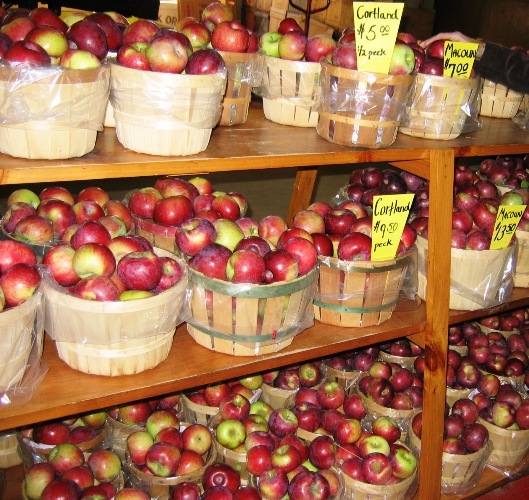 Glad you're getting your fix of New England apples, and maybe even a little snow? Oh aren't they just gorgeous! would you like to publish your recipes at my foodblog? You picked a perfect Fall week to be in New England. These muffins practically scream "New England", too -- apples and streusel, in muffins or cakes, are a perfect combination. These look delicious and I can't wait to try them with a cup of coffee! I'm always looking for new muffin recipes. Oh yes - other parts of the countries can brag about their apples but New England tops all. I love, love, love apple season, and I can never find me enough recipes to do the season justice. Thanks for giving me a new one! pretty apples-who doesn't love muffins. Those muffins look absolutely scrumptious! Hooray for fall and all the yummy treats it brings. I just stumbled upon your site and your recipes are making me very, very hungry! These muffins sound delious. They will be good on a cold morning before I go to school. I love your recipe and will be marking it to test on my oldest... he loves a homemade muffin for his snack at school! Hi Everyone! Thanks for all of your lovely comments and well wishes. Yes, we did have a wonderful time, and I'll be posting all about it soon! Thanks again!